Arthur H. James, Governor of Pennsylvania, 1939-1943. In 1935 Pennsylvania Governor George Earle launched Pennsylvania's "Little New Deal." Four years later, his successor, Arthur James did his best to torpedo it. 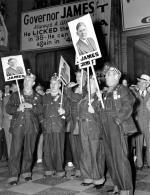 "If the nation is managed as it has been for the last five years," James bellowed during his 1939 campaign for the Governor's seat, "our streets really will be covered with grass and our hills deserted." 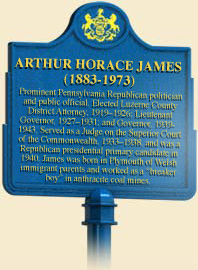 The son of Welsh immigrants, James grew up in a large family in a small Luzerne County mining town. As a child, he worked as a breaker boy in the mines around Plymouth. Unlike most of his neighbors, James benefited from a strong familial commitment to education. Under his schoolteacher father's guidance he studied hard and became an excellent orator. While attending Dickinson Law School, James continued to work summers as a mule driver in the local mines. After graduating in 1901, he returned to Plymouth, entered private law practice, and after a stint as district attorney for Luzerne County, entered statewide politics. 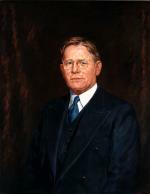 In 1927 James was elected Lieutenant Governor under Republican Governor John Fisher, and after his term ended in 1931 was elected to the State Superior Court. Like many men of his generation, James believed in the dignity of labor and hard work, and like many "self made" men, he devoutly rejected the notion that government should in any way interfere with or attempt to regulate the free market. Instead, he embraced the age-old philosophy of self reliance. Hard working Pennsylvanians should pick themselves up by their own bootstraps. James and other conservatives believed that New Deal programs had undermined that tradition by the large role they accorded to the state in everything from the welfare distribution to business regulation, particularly industrial codes and pro-labor legislation. Like other members of his party, he also believed that the New Deal and Democratic policies were holding back economic recovery. As a gubernatorial candidate, James campaigned on a straightforward platform: his opposition to the New Deal and to New Deal sympathizers in the Republican Party. During the Republican primary, James aimed his barbs at fellow GOP candidate Gifford Pinchot. Showing little deference to the former governor, Judge James claimed that Pinchot was a Democratic sympathizer who would willingly sell the GOP "down the New Deal river." At the same time, he accused Democratic governor George Earle of trying to tax his way out of the Depression, and of driving business from the Commonwealth in the process. He also bemoaned Pennsylvania's plunge into "social engineering." In 1937 the Democratic majority in the state legislature had passed a body of "Little New Deal" legislation that included a series of minimum wage bills sponsored by Anne Brancato and other progressives. James bluntly suggested that setting this legislation ablaze in a bonfire was "the finest tribute we could pay it." James won the Republican primary through plain hard work. A tireless campaigner, the Judge reportedly traveled more than 10,000 miles throughout the state, and spoke to gatherings large and small. Early in 1938, state Democrats looked unbeatable. FDR had won Pennsylvania by a clear majority in 1936, and looked to repeat again in 1940. Corruption scandals, however, rocked the state's Democratic leaders as the election approached, and internal squabbling over Earle's successor left the party deeply divided. James exploited the disarray, and with the support of the Pennsylvania Manufacturers Association and other New Deal opponents, defeated Democrat Charles Alvin Jones by nearly 300,000 votes. Late in the campaign, James even managed to pick up the support of black Democratic leader Robert Vann and presumably many other African American voters who felt that the Democrats had ignored them. In the 1938 elections, the Republicans also regained control of both houses in the state assembly. "Seventy days ago the people of this Commonwealth wrote a second Declaration of Independence," James declared at his inauguration. "Overspending and overtaxation have dried up the wells from which the waters of industrial life should flow." Repealing Pennsylvania's Little New Deal legislation, however, proved difficult. James did manage to slice $1 million from the state budget and to gut the Public Utilities Commission, but he could not balance the budget without trimming relief, which would have been political suicide. Budget pressures also made it difficult to refuse federal money for work relief programs. Dismantling the new state welfare system and returning to the old system of county relief boards - a traditional source of GOP patronage - also proved unfeasible. The result: taxes did not go down and the relief system established in Earle's administration through the Department of Public Assistance remained intact. James and his Republican allies had more success undoing some of the pro-labor measures passed under the previous administration. The "Little Wagner Act," a 1937 law modeled after the national legislation that guaranteed workers' right to organize and bargain collectively, became the target of most of these attacks. During the 1939 session, Republicans succeeded in passing a series of amendments that reduced worker benefits won during the Earle administration. Another provision enabled employers to bring in strikebreakers to resume production, thus bypassing the state Labor Relations Board. James also made good on his promise to improve the business climate by creating a state Department of Commerce, designed to encourage industry to stay in the Commonwealth. Mobilizing the state in the early years of World War II, James finished out the second half of his term in less partisan circumstances. He did call in the state police to break up a sit-down strike by Bethlehem steelworkers in 1941, but his last years as governor were largely devoted to war preparations. In the short run, James had helped restore some of the power that the GOP had lost in the mid-1930s, but he and his fellow Republicans were unable to restore the party's previously unchallenged hegemony. By the 1940s, most Pennsylvanians, and most Americans, had come to accept the deep ideological and political changes wrought by the New Deal. To learn more about James and Pennsylvania during World War II click here. Richard C. Keller, Pennsylvania's Little New Deal (New York: Garland Publishing Co), 1982. James T. Patterson, The New Deal and the States: Federalism in Transition (Princeton, NJ: Princeton University Press), 1969.